Deep sea corals off Florida. Image via NOAA. Earlier this year I was part of a research expedition conducted by the Deep Search project, which is studying little-known deep-sea ecosystems off the southeast U.S. coast. We were exploring areas that had been mapped and surveyed by the U.S. National Oceanic and Atmospheric Administration’s research ship Okeanos. Map of target areas to be surveyed during the first phase of the Deepwater Atlantic Habitats II study, DEEP SEARCH, including seep targets. USGS image. NOAA Ship Okeanos Explorer is the only federal vessel dedicated to exploring our largely unknown ocean for the purpose of discovery and the advancement of knowledge about the deep ocean. The ship is operated by the NOAA Commissioned Officer Corps and civilians as part of NOAA’s fleet managed by NOAA’s Office of Marine and Aviation Operations. Mission equipment is operated by NOAA’s Office of Ocean Exploration and Research in partnership with the Global Foundation for Ocean Exploration . Missions of the 224-foot vessel include mapping, site characterization, reconnaissance, advancing technology, education, and outreach—all focused on understanding, managing, and protecting our ocean. Expeditions are planned collaboratively, with input from partners and stakeholders, and with the goal of providing data that will benefit NOAA, the scientific community, and the public. During Okeanos Explorer expeditions, data are collected using a variety of advanced technologies to explore and characterize unknown or poorly known deepwater ocean areas, features, and phenomena at depths ranging from 250 to 6,000 meters (820 to 19,700 feet). The ship is equipped with four different types of mapping sonars that collect high-resolution data about the seafloor and the water column, a dual-body remotely operated vehicle (ROV) capable of diving to depths of 6,000 meters, and a suite of other instruments to help characterize the deep ocean. Expeditions typically consist of either 24-hour mapping operations or a combination of daytime ROV dives and overnight mapping operations. 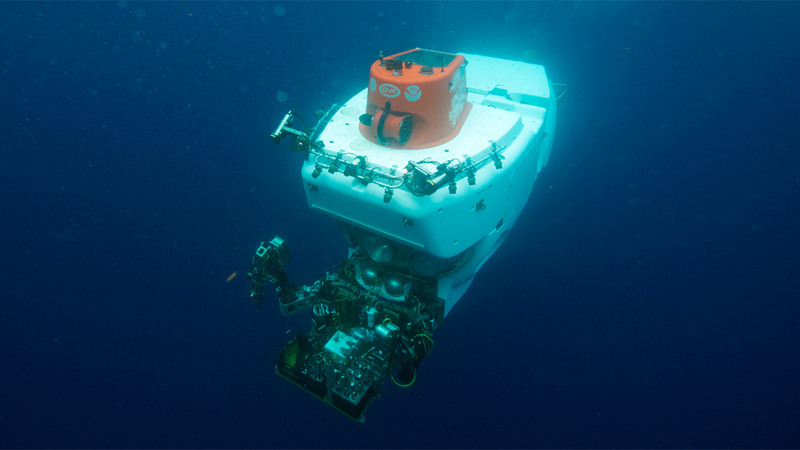 In an area 160 miles off South Carolina we deployed Alvin, a three-person research submersible, to explore some features revealed during the mapping. What the scientists aboard Alvin found was a huge “forest” of coldwater corals. I went down on the second dive in this area and saw another dense coral ecosystem. These were just two features in a series that covered about 85 miles, in water nearly 2,000 feet deep. This unexpected find shows how much we still have to learn about life on the ocean floor. Deep corals are found in all of the world’s oceans. They grow in rocky habitats on the seafloor as it slopes down into the deep oceans, on seamounts (underwater mountains), and in submarine canyons. Most are found at depths greater than 650 feet (200 meters), but where surface waters are very cold, they can grow at much shallower depths. Shallow corals get much of their energy from sunlight that filters down into the water. Like plants on land, tiny algae that live within the corals’ polyps use sunlight to make energy, which they transfer to the coral polyps. Deep-sea species grow below the sunlit zone, so they feed on organic material and zooplankton, delivered to them by strong currents. In both deep and shallow waters, stony corals – which create hard skeletons – are the reef builders, while others such as soft corals add to reef diversity. 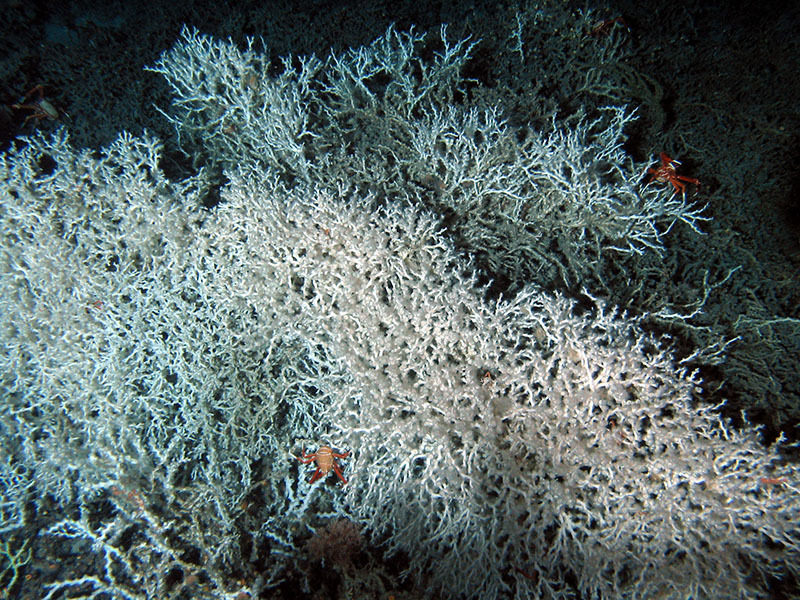 Just five deep-sea stony coral species create reefs like the one we found in August. The most widely distributed and well-studied is Lophelia pertusa, a branching stony coral that begins life as a tiny larva, settles on hard substrate and grows into a bushy colony. As the colony grows, its outside branches block the flow of water that delivers food and oxygen to inner branches and washes away waste. Without flow, the inner branches die and weaken, then break apart, and the outer live branches overgrow the dead skeleton. Other important types include gorgonians and black corals, often called “tree corals.” These species can grow very large and form dense “coral gardens” in rocky, current-swept areas. Small invertebrates and fishes use their branches for shelter, feeding and nursery habitat. The greatest threat to deep corals globally is industrial bottom-trawl fishing, which can devastate deep reefs. Trawling is indiscriminate, sweeping up unwanted animals – including corals – as “bycatch.”“ It also stirs up sediment, which clogs deep-sea organisms’ feeding and breathing structures. Other forms of fishing, including traps, bottom longlines and dredges, can also impact the seafloor.